In Hawaii, teriyaki is everywhere. I was pleasantly surprised to find that was the case here in Washington too. Unfortunately it’s not quite the same. In Hawaii it’s just a typical part of the local restaurants, here there are specific teriyaki joints, but they’re often so goopy and sweet and covered in way too much sauce. 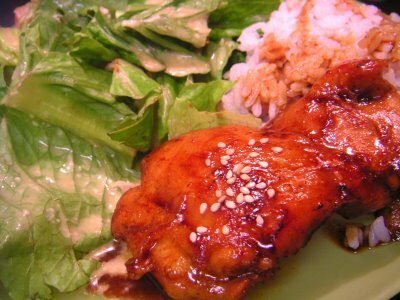 I never really made teriyaki for myself in Hawaii because it was everywhere and cheap. It was at every party or potluck, friends would make huge batches and drop some by, I probably had it at least once a week. But the past two years I’ve only had it maybe five times and was disappointed each time. I’ve made it with friends in Hawaii before, so had a basic idea of how to make it. I was also excited to realize I had something else to do with those chicken thighs I’m not crazy about. I forgot that teriyaki chicken is a great recipe for thighs. But I was looking at one of my favorite Asian cooking blogs and found this post by guest blogger My Cooking Hut. The ingredients sounded right from what I remembered, the method definitely sounded right. Hooray! Only thing was, I don’t have any sake, so I decided to sub some rice vinegar. It came out perfect and I really loved it. The funny thing was, after Eric finished it, he said it was okay but he’s never really liked teriyaki. But then he took the two servings of leftovers to work the next day for lunch, and ate them all! He came home singing the praises of my teriyaki and saying it was so much better the next day. Since he finished it, I didn’t get to try it to see if it was actually different the second day, guess I’ll have to make it again! 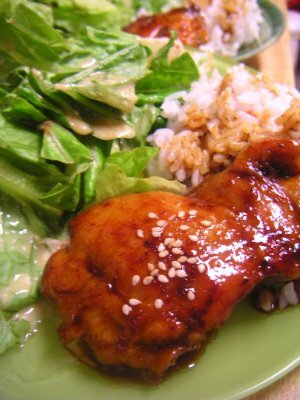 I served it with some sticky rice and romaine lettuce with a tangy pseudo asian dressing (I say pseudo because I don’t usually associate mayo with real asian recipes, but other than that it has the same flavors). Thanks Rasa Malaysia and My Cooking Hut! Defrost your thighs in the fridge overnight. 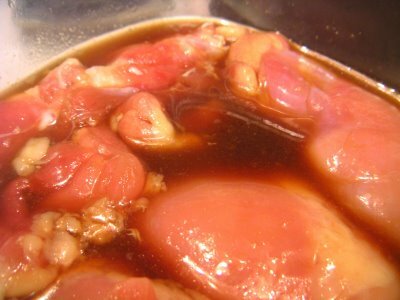 Mix rice vinegar, shoyu, mirin and sugar well in a bowl or tupperware. Marinate the thighs in it for 15 minutes. 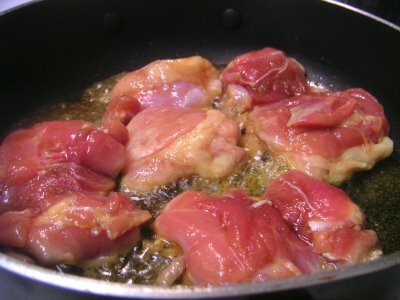 Heat a tablespoon or two of oil in a pan on medium high, brown both sides of the chicken thighs and leave until cooked. About 5 minutes each side. Pour the teriyaki sauce that was used to marinate the chicken into the pan and continue to cook until the chicken is glazed (another few minutes). Remove from heat and serve chicken over rice. Drizzle with leftover sauce from the pan. Mix everything in a small bowl with a whisk or fork. Drizzle over lettuce or cabbage.